I've been feeling a little adventurous lately and been wanting to try out different types of cuisines other than the same, usual boring stuff I'm used to having. Conventional foods like grilled steak and steamed bass have become so commonplace that I longed for dishes that are exciting, new and creative. So one Friday night, I went online in search for a new restaurant to try and came across M Wells, a new French Canadian restaurant that has recently opened in Long Island City, Queens. The fact that M Wells was actually in Queens, (and right by my neighborhood too) got me really excited because it's nice to know that I don't always have to travel to Manhattan for new, ethnic cuisines. Outside, M Wells looks like an ordinary diner but inside, their food is anything but ordinary. With dishes like salmon coulibiac and foie gras tamales, their menu is filled with a wide array of amazing creations from the mind of Hugue Dufour. I knew I was in for a real treat when I found out that Dufour was a former chef at Au Pied de Cochon in Montreal. As usual, I could never decide what to order, but the veal brain was the first thing that popped out right at me from the menu. A lot of people would find that off-putting, and I had to admit that I was a little hesitant at first. However, I reminded myself that when it comes to trying food, I had to be more gutsy and adventurous. So with an open mind, I told my waiter what I wanted. "Excellent choice! It's a very popular dish tonight," he said. It had to be popular for a reason. 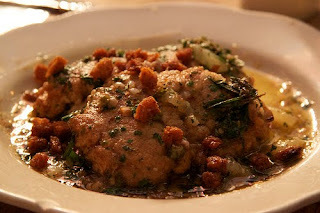 So I had veal brains for the first time in my life that night and you know what? It wasn't that bad. It reminded me of sweetbreads because it had a smooth and creamy texture. It definitely looked like a brain, there's no doubt about that. It was lightly fried and seasoned with a rosemary and balsamic vinegar sauce. The complexity of the textures and flavors made this dish surprisingly good. 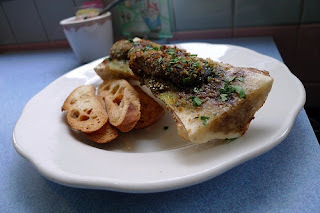 I also ordered the escargot in bone marrow. I've had escargot before so my expectations were really high. It tasted good and the plating was very creative and original, but I've definitely had better. For dessert, I ordered the Paris brest which is a ring shaped choux pastry filled with praline flavored cream. The flaky pastry and fresh cream makes for an awesome dessert. The only thing that threw me off was that they charge $16 for it. Their menu changes from time to time so if you're planning on going back to order the same thing, I would call ahead of time first to make sure they have it so you wouldn't be dissapointed once you get there. As the saying goes, when it comes to trying something new, approach it with an open mind and an empty stomach and you might be pleasantly surprised.